The Under Slab Radiant Heating (also known as Earth Thermal Storage) that Petra Building Solutions distributes is the most cost effective and efficient heating system available. It is a system that uses the thermal mass of the earth to store the heat during electric off-peak rate hours, and reabsorbs it back to radiate it to the room when the temperature inside drops. This maintenance-free system saves homeowners and building operators on their energy consumption costs, while creating a comfortable and healthy environment for the residents of the building. There is also significant saving on labor, as the installation of the system, including the electric technician’s work, for an average size building can be done at a rate that is 3 times faster than any other system. 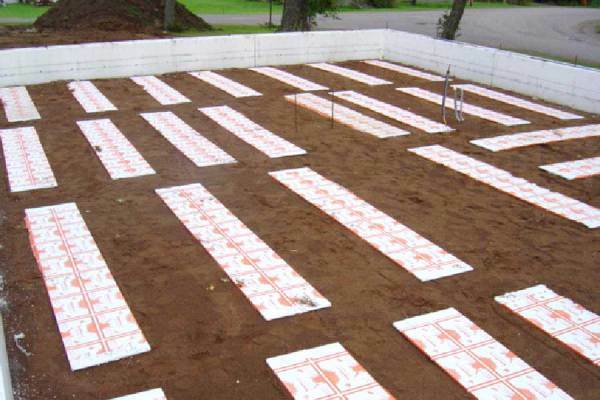 Under Slab Radiant Heating is the ideal heating system for basements, slab-on-grade construction, solariums and sunrooms, industrial buildings, warehouses, manufacturing facilities, aircraft maintenance hangars, malls, and car and truck facilities. The system is designed to charge (energize) during off-peak electricity periods, or to shift peak demand to quieter periods, therefore saving enormously in energy costs. No energy is wasted, since the stored energy is only released when the area above it becomes cool. Otherwise, the radiant heat remains where it is. This heating system can be safely and efficiently used even in the most hazardous areas, as it is safeguarded from mechanical harm, corrosive chemicals, and moisture. The warmth is spread in such a way that prevents hot spots and drafts, creating a superior heating comfort and a gentle even temperature from floor to ceiling. Each room temperature can be programmed, in order to minimize operating costs and be verified from anywhere in the building. Quiet, safe, and clean system, which creates no smoke or shoot. Space efficient, as it takes no floor space.